THIS week we present a cover by Colcord Heurlin! 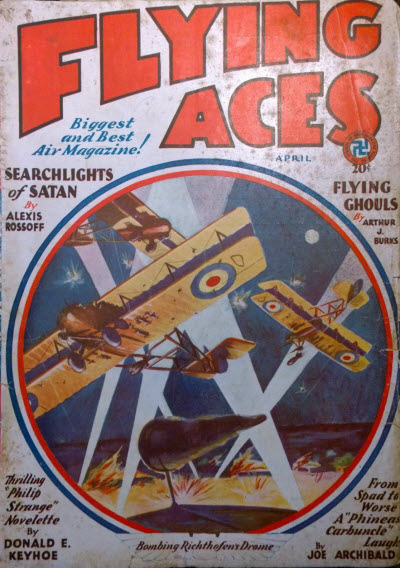 From 1923 to 1933 Colcord Heurlin painted covers for a wide range of pulp magazines. 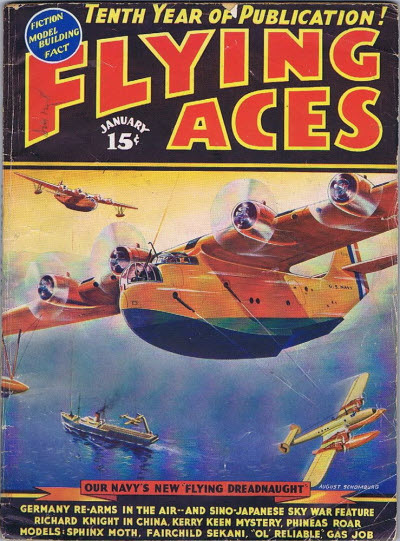 His work appeared on the covers of Adventure, Aces, Complete Stories, Everybody’s Combined with Romance, North-West Stories, The Popular, Short Stories, Sky Birds, Sea Stories, Top-Notch, War Stories, Western Story, and Flying Aces! 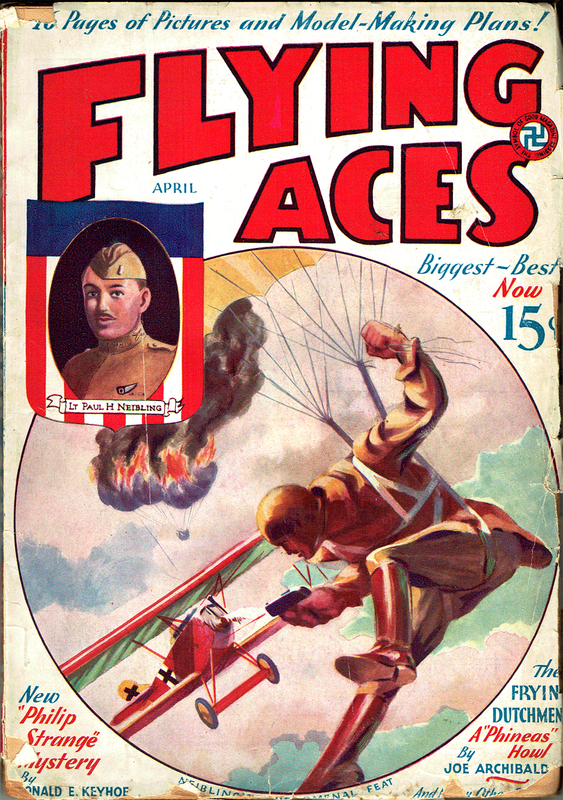 THE tense drama of night bombing is clearly shown in the cover of this month’s issue. Many stories of these Boche bombing raids have been told. First the ominous whir of enemy wings sounded through the night. In the drome below, lights were hastily put out, and helmeted figures scurried to their ships to take to the air and ward off the dreaded danger. 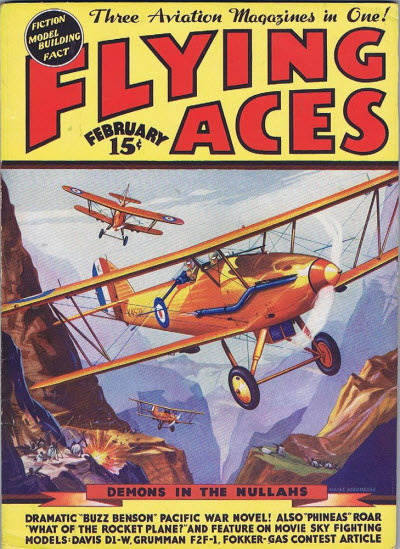 Streaks of Archie fire felt futilely through the black night sky for the range—and then the bombs fell, hurtling downward through the darkness on the tarmac beneath. 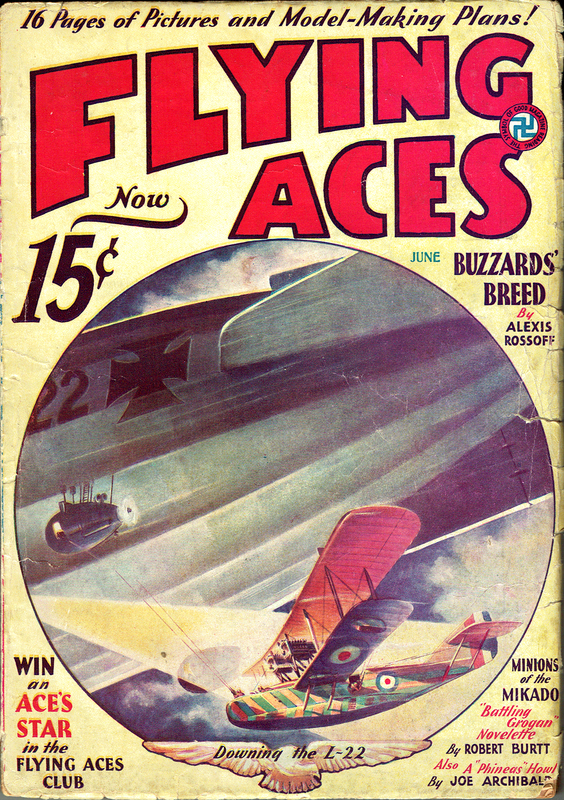 Sometimes, as in our cover, an Allied ship took off in time to get above the bomber, and a powerful searchlight caught the German ship in its merciless glare. Then, though the Archie shells burst harmlessly about, death tracers from the sputtering Vickers above caught the German gunner. That was one ship that did not flee to Germany unscathed, leaving death and destruction behind. 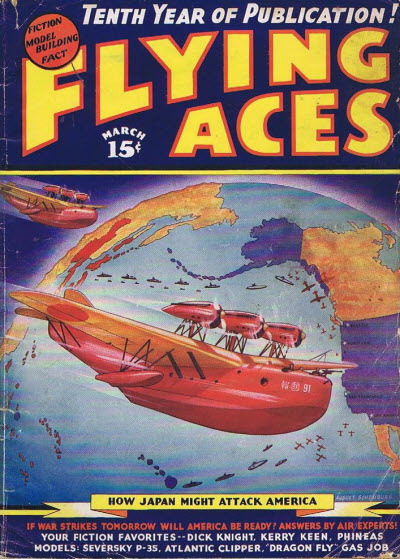 “HAW-W-W-W-W!” That sound can only mean one thing—that Bachelor of Artifice, Knight of Calamity and an alumnus of Doctor Merlin’s Camelot College for Conjurors is back to vex not only the Germans, but the Americans—the Ninth Pursuit Squadron in particular—as well. Yes it’s the marvel from Boonetown, Iowa himself—Lieutenant Phineas Pinkham! Old Lady Fate had put through a mixed grill order, and it looked like the Krauts would bring home the bacon. Allied marine moguls got their ships mixed, Garrity got his signals mixed, and Goomer got his bottles mixed. All of which boiled down to the fact that Phineas was on the spot—only the M.P.’s didn’t know which spot. “HAW-W-W-W-W!” That sound can only mean one thing—it’s time to ring out the old year and ring in the new with that Bachelor of Artifice, Knight of Calamity and an alumnus of Doctor Merlin’s Camelot College for Conjurors—Phineas Pinkham. 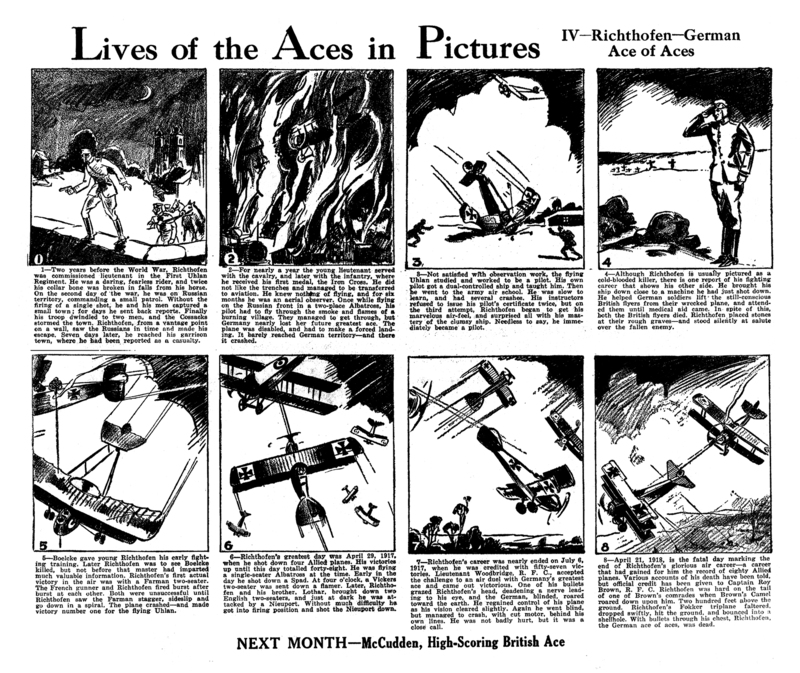 History’s pages show us that very strange things have happened in wars. They tell us that Hannibal pushed a big herd of pachyderms over the Alps to stomp on the Roman legions. They tell us about the wooden hobby horse that the Greeks pushed through the gate of Troy and how the faces of the Trojan boys went red when they discovered that the jokers from Athens had not come in to open a restaurant. There is the tale about George Washington crossing the Delaware when it was filled with ice cakes and how his Continentals kicked the Hessians around because they had been drinking too much New Jersey corn. But the strangest thing that ever happened in any war took place in France in the year of our Lord Nineteen Hundred and Eighteen. Somebody made Lieutenant Phineas Pinkham a colonel! That letter the War Department tossed across the Atlantic smack onto Garrity’s desk certainly had an innocent appearance. But when it was opened, the 9th Pursuit was turned upside down so fast that it looked like the 6th. For Phineas Pinkham had been made a COLONEL! 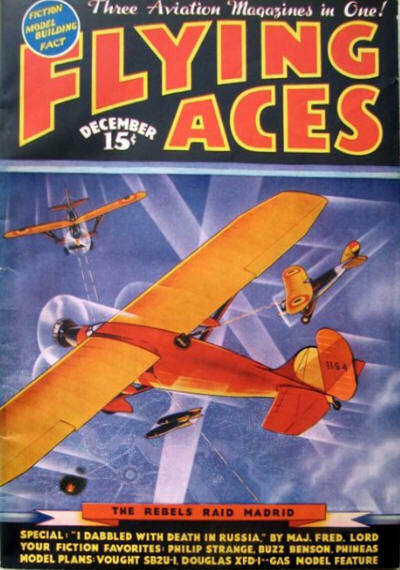 “Aces of Death” from the pages of the January 1938 issue of Flying Aces is Keyhoe’s eight story with the intrepid Q-Agent and his pal Larry Doyle. 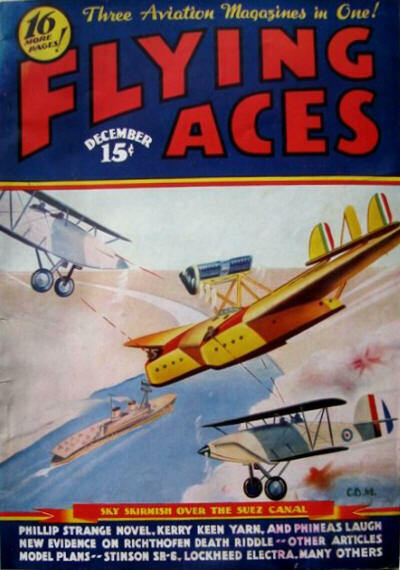 What infernal power had loosed those gun-bristling Grummans upon stricken China? 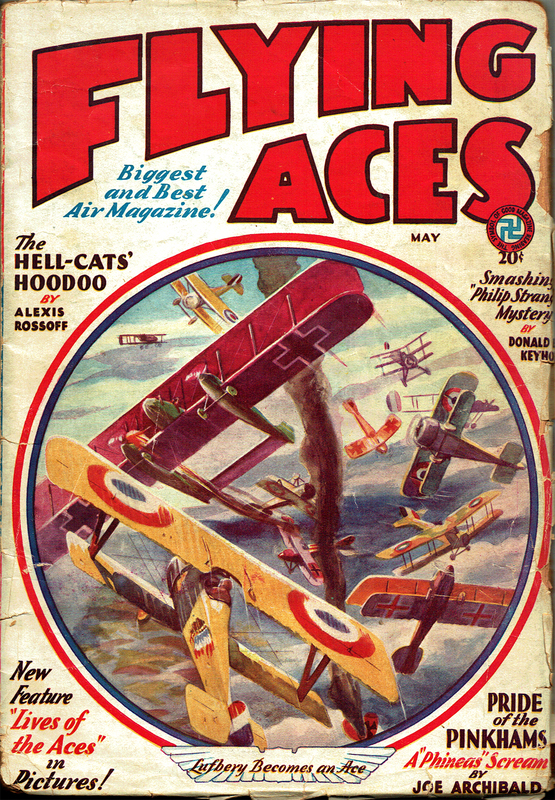 And who were the merciless white devils who flew them like madmen and who fought like fiends? This sinister riddle called for the unfailing skill of Richard Knight. But even that ace agent was balked. 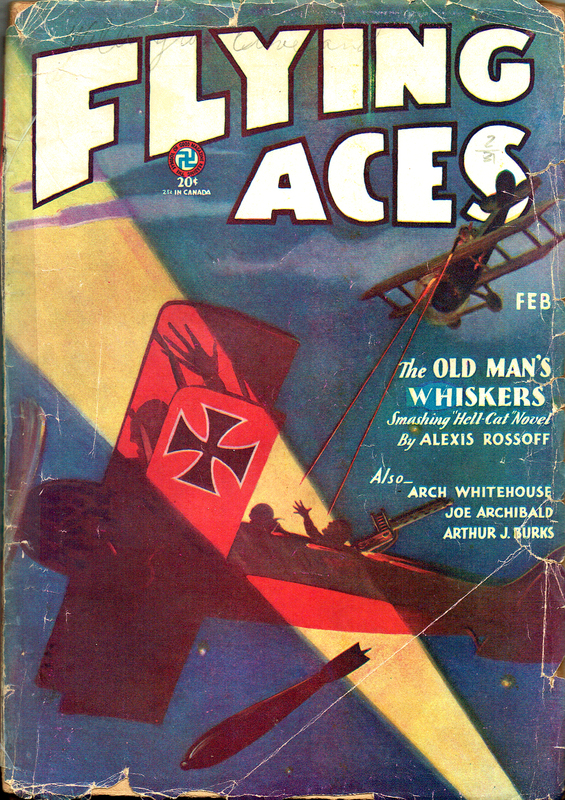 For the winged killer from whom he sought to wrest its answer leaped into the flaming inferno of his own fallen plane—gave vent in his death throes to a defiant scream of triumph. What do you get the man who has everything? 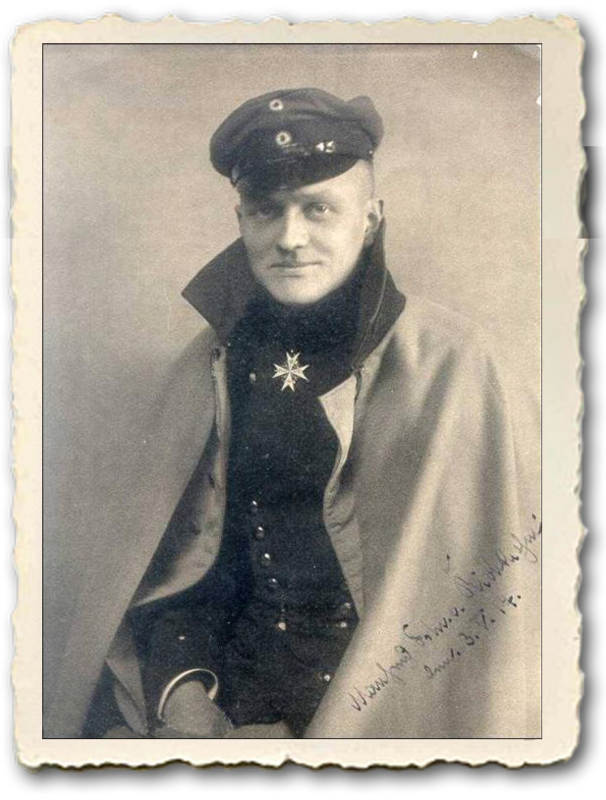 If you’re Herr Hauptmann von Spieler and you’re looking to please his Excellenz Kaiser Wilhelm, you go out and get him that one thing no one has been able to get—Lieutenant Phineas Pinkham! Just make sure you wrap it well! Over in Kraut-land spirits were high. Flourish and fanfare heralded a super celebration in honor of the A-l Hohenzollern. And the first dish listed on The Great One’s menu was—”Phineas Pinkham on the Half-Spad.” But too many cuckoos spoil the hasenpfeffer, and though the meat is sweeter near the joint, the Vons hadn’t figured on double joints. “The first hundred ears are the hardest!” So quoth Carbuncle when he met Sambo Jambo, razor-welding pride of the Senegambians. But though a pair of galloping dominoes threatened to put poor Sambo on the Five Ear Plan, it was the No Ear Plan that had Herr Hauptmann von Speiler worried. Editor’s Note: Joe Archibald’s Phineas Pinkham stories are a product of their times, reflecting attitudes toward certain races and cultures commonly held in America in the 1930’s. As such, these tales can sometimes be rife with derogatory or racially insensitive words or stereotypes which would scarcely make it into print today. 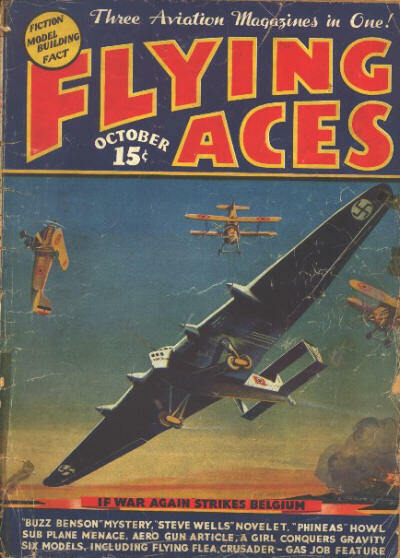 We have chosen to present the stories as they were written some 80 years ago in the interests of authentically preserving this bit of Pulp history. 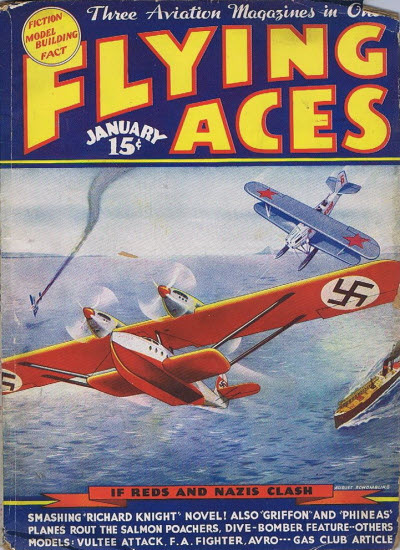 Age of Aces Books means no disrespect by including this potentially offensive material. Quite the contrary. It is the respect we have for our discerning readers that demands we present Archibald’s fiction unexpurgated. A peace between Russia and Germany was impending. Chaumont, Downing Street, Pennsylvania Avenue, and Versailles were in more than a dither as rumors flew hither and yon over the map of Europe to the effect that the Heinies were trying to get the Russkys to throw in with them and start cleaning up on the Western Front. The situation was more of a mess with left wing and right wing revolutionists brawling on the Steppes. Trotsky and Kerensky were making faces at each other and tweeking each other’s beards. Red and White Russians were at loggerheads. The Czar and his family had been chased out of St. Petersburg. The Czechs were getting to be a nuisance, and Cossacks were pulling straws to see which side they would fight on. Things certainly looked tough for the Allies! 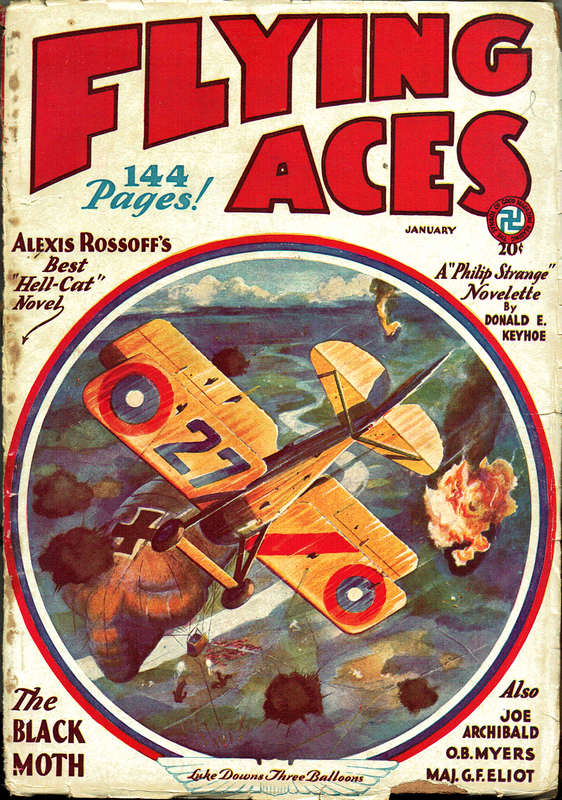 The Wilhelmstrasse quoted 2 to 1 that the Russkys would join up with the Krauts—and the 9th Pursuit laid 3 to 1 that Phineas would join up with the angels. But when the Vons ordered caviar, Carbuncle served greased bird shot. And when Rasputin rose from the grave ….